Join West Side Los Angles CA parents and educators to chat about you, your child, and school. 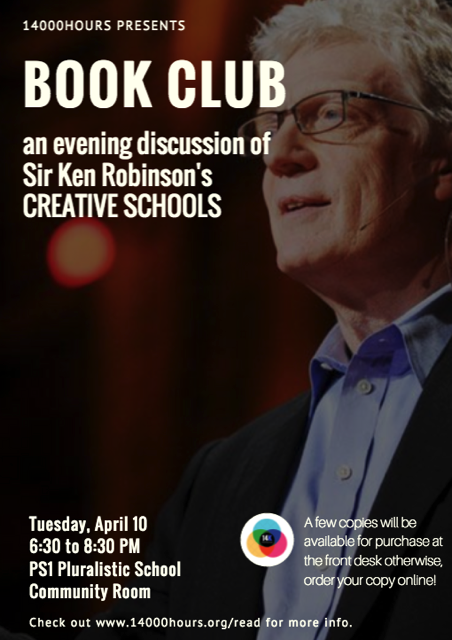 Come for a Book Club discussion on Sir Ken Robinson’s book, Creative Schools. Hosted by 14000hours.org, an initiative of PS1 Pluralistic School in Santa Monica, share your strategies on how parents can partner effectively with schools and your thoughts on what you see as the primary purpose of school for K-12 children. Light refreshments and wine will be served. Copies of the book are available for purchase at PS1’s front desk, or, on Amazon. All welcome. Sponsored by: 14000hours, an initiative of PS1 Pluralistic School, Santa Monica. We bring together diverse perspectives to listen, learn, and work together in actionable and inspirational ways. 14000hours helps parents and educators uncover the best in their students and children through the best use of the 14,000 hours of time each child spends in K-12 school.